Dango is a Japanese dumpling or sweet made from mochiko (rice flour). 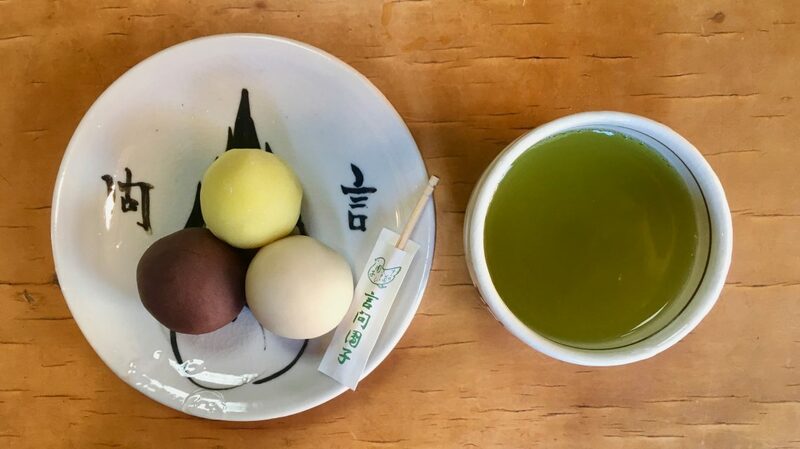 The shop Kototoi Dango in Mukōjima was established in the late Edo period (1603-1868) and is famous for the tri-coloured dango that are served on a plate, rather than on a skewer. Tokyo has a number of traditional dango shops. 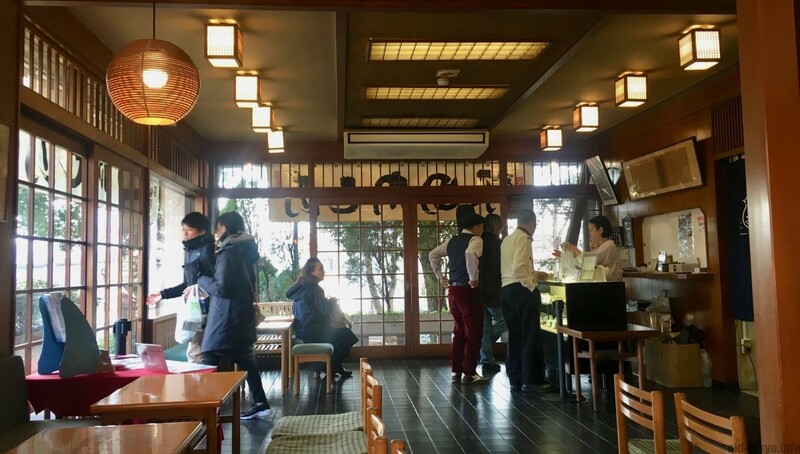 I visited before Habutae Dango where I had a very satisfying yaki-dango & an-dango, and in Shibamata I had the classic kusa-dango. The name Kototoi originates from a poem in which a seagull is featured, and was the name of a nearby bridge that lent its name to this store. 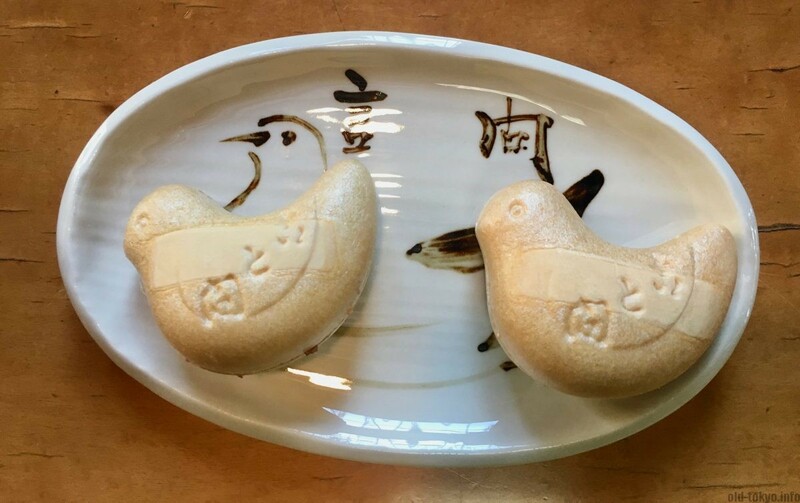 A seagull (miyako-dori in Japanese) became the symbol of this store and shown on all its plates on which the dango are served (the bird looks a bit like a dove though). It appeared the shop was able to appeal to a wider audience due to many people visiting the area during the annual fireworks at the Edo river. The shop is said not to have changed their flavour since the start. Their dango are very soft and easy to eat and come on a plate in 3 colours: white anko (white), red anko (red) and miso (yellow). A gardener and teacher (Mr. Toyama Sakichi) started to make these dango, they became popular and the rest is history. Over the years, the shop was featured in popular culture. Among its famous customers are Takehisa Yumeji (1884-1934), a Japanese poet and painter. However, it seems that is has less of a vivid and famous customer base in comparison to Habutae dango. They also have monaka with red and white anko paste inside in the shape of a seagull. This taste is much more strong than the dango. Monaka consists of 2 thin crisp wafers with in between azuki bean jam (anko). I visited the shop on a Sunday afternoon and there were people coming in and out of the store all the time, but most people just bought dango to take home and did not have a seat. Therefor I was surprised at how much space there was to sit. The people who sat down were also very quick to leave again, they ate the dango and quickly left in 5 minutes. I guess I was the exception by staying a bit longer and trying both the dango and the monaka. 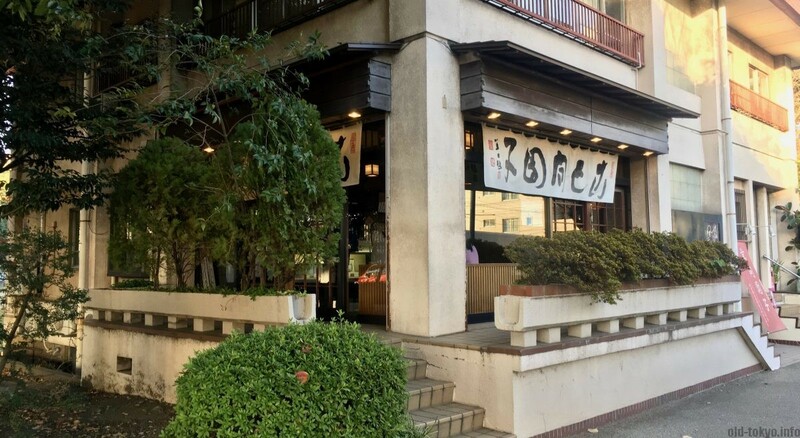 At the other side of the street is another famous wagashi (Japanese sweet) store serving sakura mochi that I visited before during my mukojima 7 lucky god pilgrimage. Kototoi Dango exterior, unfortunately not an old building. Also sold in packs of six to take home for JPY 1260, please note that you need to eat them the same day!